Every New Year brings the usual New Year's resolutions. Time to lose weight, exercise more, get a promotion, and of course, save money. 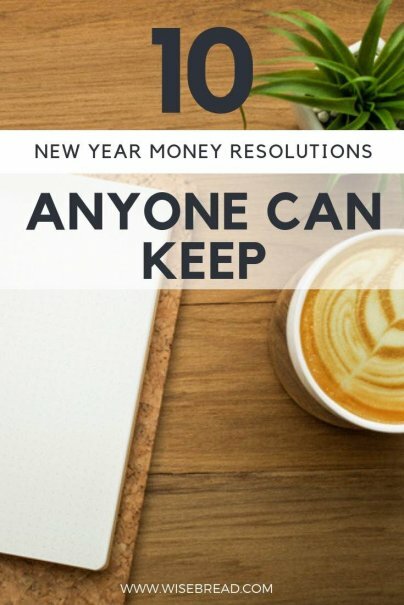 I'm not going to tell you to cut out cups of fancy coffee, or contribute more to your 401K — you've heard that before, and no doubt will again. These are some easy resolutions that absolutely anyone can keep. If you want to save money in 2016, start right here. There are so many great apps that make it effortless to save money. Most of the time, you don't even know you're doing it. For example, Acorns automatically rounds up your daily purchases to the nearest dollar, and applies the difference (what you would call spare change) to an investment account. Digit will monitor your spending habits, and safely move some of your money into a savings account when you can afford it (it comes with a no-overdraft guarantee as well). Do a quick search in the App Store or Google Play Store, and download the apps that you are most comfortable with. Then, set it and forget it. The money soon adds up. Sure, it's nice to have brand new things, but often it's not essential. By buying used, you'll save yourself a whole lot of cash over the year. Pick up gently used clothing at thrift stores or on eBay at a fraction of the price they retail for brand new. Cars should always be bought used, as new ones depreciate in value the second you drive off the lot. For electronic items, kitchen appliances, and even furniture, look for factory seconds, or manufacturer refurbished. Every time you buy used, you are making significant savings. During the year, you'll acquire new things, and throw away old ones. Well, not so fast. Although it's easier to just put items in the trash or the donation bag, it is also very easy to sell them. Sites like Etsy, Craigslist, and eBay make it very simple. All you need to do is take a few good snapshots using your smartphone, and list using the templates provided. You can make hundreds of dollars a month from an investment of just 10–15 minutes a few times a week. It used to be a chore to go through the circulars every week and cut out coupons. These days, you can "clip" coupons electronically, and it is so easy your kids can do it for you. Apps like Cartwheel by Target, Cellfire, Coupons.com, and Grocery IQ make it painless. Many of them apply the coupons directly to your grocery store loyalty card, and others send scannable coupons to your phone for easy access. It's free money just waiting to be collected. Making spaghetti and meatballs for 12 people is almost as easy as making it for four. It can save time and money by preparing meals in large batches. Take advantage of bulk pricing, especially on meats and canned goods (those 10 for $10 deals can be invaluable). And, you're creating meals that can be frozen and reheated at a later date, perhaps for lunch at work, or for dinner again later in the month. Even if you live alone, cook for a big group of people. It's way cheaper than buying ready meals, and easier than cooking every night. Credit and debit cards are very convenient, but they make spending money mindless. If you withdraw cash, you can see it being spent as you go, and this makes it easier to understand your own spending habits. Make sure you use either a free ATM, or go into your branch to make the withdrawal to avoid fees. By all means, carry an emergency card, but it really should be for emergencies only. If you get brave, try leaving the house without it now and again. Sure, you may not have enough cash for everything you want, but maybe you don't need all of those items anyway. Books, CDs, and movies are cheap enough to rent or own, but almost every title you can think of will be available for free at your local library. What's more, you don't even have to physically go into the library. An app called Hoopla lets you borrow digital copies of movies, audiobooks, ebooks, albums, and more. After a set amount of time, the items come due and are removed from your account. No late fees, no hassle. You'll be surprised at how much you save. You can pay a lot less for your insurance policies simply by raising the deductible. If it's currently at $500, raise it to $1000, or even $2000. You will see a massive drop in the monthly premium. Now, you may think "But if anything happens, I'll have a bigger bill." Yes, you will. However, consider the fact that on homeowners insurance, the average household makes a claim every 10 years. For auto insurance, the average is every 17.9 years! Think about that. You are paying a lot extra to keep that deductible low, and the chances are, you'll only ever need it a few times in your life. Still, to protect yourself, beef up your emergency fund to cover the deductible. It's one of the simplest things you can do to save money at the grocery store, and takes little to no effort on your part. From laundry detergent and cereal, to breads, cheeses, and coffee creamers, there is usually a generic version for almost everything. They can be less than half the price of the name brand, and 99% of the time, you won't notice the difference. If no one is home, there is no reason to have your heat set to comfortable temperatures. A programmable thermostat will set you back as little as $50, and can save you big. You can set the heating, or A/C, to less aggressive temperatures when you're out, and program the temperature you prefer to kick in about a half hour before you arrive home. If you really want to go all out, pick up a learning thermostat, like Nest. It will adjust the temperature automatically for you based on your habits. And, it's also hooked up to the web, so you can adjust it using your smartphone.